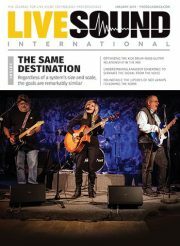 At this year’s Winter NAMM show, IsoAcoustics (Booth # 17315) is introducing the Stage 1 Isolators, the latest in the company’s line of isolation solutions for loudspeakers, stage monitors, subwoofers and musical instrument amplifiers, specially designed for touring musicians and bands on any budget. The new Stage 1 isolators effectively eliminate the vibrational variables that touring musicians experience while playing onstage in a variety of venues and locations. The Stage 1 Isolators rugged aluminum housing features a very low profile design, with a height of 1.5- inches, enabling the equipment to maintain a low stance, and allowing them to fit easily inside their road cases. This supports a quicker set up and sound check time while on tour, while eliminating the variables of stages in different locations. The new Stage 1 Isolators can support a maximum weight of 200 pounds per set of four and are designed for equipment ranging from small bass combo amps to stacked 4-12 cabinets. IsoAcoustics Stage 1 Isolators will be available in February 2019 from local retailers as a set of four; MSRP $129.99 (US).